The oceans of the Earth can exist without us. If we humans become extinct, they won’t even notice we’re gone. We, however, simply cannot exist without our oceans. We need them. They are the primary life support system on Earth, the lungs, climate regulator, and ultimate food factory - connected deeply to each of us and nearly every economic activity that makes our world go round. For those old enough to remember - and for the young and curious, too - you may know “Earthrise,” the iconic photograph taken on 24 December, 1968 by a 35-year-old American astronaut and engineer named William Anders as he looked through a small, frosty window of Apollo 8, the first spacecraft to leave Earth’s gravity and orbit the moon. From 380,000km away, our spectacular planet appeared as a vulnerable, mostly blue sphere, vividly illustrating their size and importance – they cover some 70% of the Earth with an average depth of four kilometers. Since then, we’ve explored just 10% of our oceans’ contents. We’ve learnt they provide 99% of the Earth’s living space and contain around 80% of all living organisms. They are the largest space in our universe known to be inhabited by organisms. They provide our Earth with a moist, livable climate, full of oxygen from trillions of microscopic plants floating like tiny stars in a watery, immense universe, producing close to 100 million tons of food each year, enough to provide one in every four or five people with their daily protein. They are also crucial to our climate system. There is more heat stored in the first 10 feet of the ocean than in the entire atmosphere. This is significant because heat is transferred from the atmosphere to the ocean. 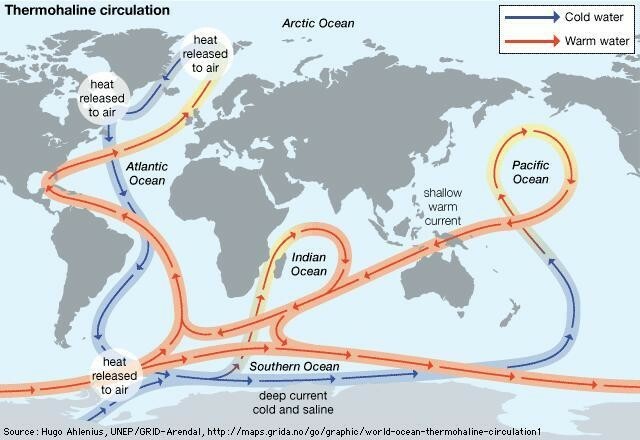 Then currents move heat throughout the ocean and across the planet. The gulf stream, an intense warm current, is the major source of north-south heat transfer in the Atlantic. It starts in the Gulf of Mexico, snakes around Florida, and then goes northeast across the Atlantic, expanding like a funnel until it gets to Europe. The heat transferred by this “river within an ocean” brings a mild, moist, warm climate to Europeans. The gulf stream moves this heat at a speed 300 times the average speed of the Amazon, and at a volume greater than all rivers in the world, combined. Without the gulf stream, England would be like Alaska and upper Norway would resemble Antarctica. But for all its might, the gulf stream is fragile and could change, or even shut down within 10 years if we keep heating our planet the way we are, disrupting the exquisite balance of this unusual oceanographic phenomena. By any measure, scientific or anecdotal, the global ocean makes Earth a nice place for us all to live. If you want to see what the Earth might be like without an ocean there are plenty of examples in our own solar system. Sadly, in spite of the birth of modern oceanography, our oceans did not garner anywhere near the same budget and attention as space exploration. We looked up instead of taking note of the trouble brewing right beneath our noses, along our shores and under our docks. Since the 1970s, a lot of damage was done when countries all over the world developed their coastal areas, destroying reefs, salt marshes, and mangroves along the way. Our population grew from four to over seven billion people, and as the middle class expanded so did consumption, especially in the realm of oil, coal and natural gas development. Newly minted fleets of fishing boats depleting most of our wild stocks of edible ocean life. We polluted our oceans with agricultural runoff, oil, plastic and other synthetic chemicals. Through the thousands of dives I conducted during this period in all five oceans, I had a front row seat to this seemingly endless destruction. Fortunately, this is changing. Countries all over the world now understand that the blue planet, as Anders saw it from the Apollo spaceship nearly 50 years ago, is an ocean planet, and it’s on us to make sure we never forget that. Three landmark agreements in 2015 give us the international framework we need for action. The Paris climate summit acknowledged that if we are to understand and solve climate change, oceans must be part of the equation. There was renewed evidence of the governance of the ‘High Seas’ – the area beyond any national jurisdiction. And the UN also adopted 17 Sustainable Development Goals. Goal 14 focuses on conserving our oceans. This makes 2015 the most important year in the history of the world as far as committing to take collective action on the global ocean. It should be clear to anyone concerned with the health of our civilization that our past connection to the ocean is ripe and ready to connect with a future vision; one that is fully awake to the reality that if we are to continue occupying this planet in balance with nature we must pay attention to the oceans - now. Conserving our oceans – and through them our own survival – is now more possible than ever. It will need to include all stakeholders – governments, businesses, citizens, technology developers, and indigenous populations. We are all stakeholders of the oceans and we all have something to contribute. Indigenous communities have a deep knowledge of oceans based on empirical information as old as humanity itself. For example, Aborigines in present-day Australia living alongside the ocean discovered what time of year particular coral reef fish are most nutritious and not reproducing, which becomes the best time of year to harvest and eat them. This is a time-tested, perfect system, which marine biologists and nutritionists knew nothing about until recently. We also need the innovation that well-funded, modern science can provide. We are in the midst of what some call the " Fourth Industrial Revolution ", one that embraces big data, apps, and unbridled creativity. Initiatives like Global Fishing Watch are increasing transparency and giving data access to ordinary people – on their mobile phones and in real time! I am encouraged by the optimistic millennials who intend to change the world through approaches so new we have no idea what they are. It’s what I call the “Ocean Renaissance” – a moment where technology meets tradition, where fishermen become scientists, where scientists become policy makers, where policy makers become anthropologists and where anthropologists learn the ways of the oceans from cultures like the Aborigines or Pacific Islanders, who live a symbiotic life with the ocean. The conversation will continue at the UN climate conference in Morocco this month. Even if you cannot attend, you can watch a livestream feed on the U.N. website, you can read about what happens there, and you can do something with your newfound education. Our collective actions now impact the health of the ocean. The effect of global industry, commerce and the lifestyle choices of more than seven billion people is affecting our oceans. We can degrade the salty water that covers most of our planet or we can steward it in a way that enables it to take care of us. Without healthy oceans, our life on Earth would be severely challenged, unpleasant and perhaps impossible. The oceans are the life support system of all living beings. That’s because life on Earth can thrive without land, but it cannot exist without an ocean.